1) Visit at the right time of the year. Summer may be a convenient time for you to check out schools, but it’s not always the best time to get a good feel for a campus. With few students on campus during the summer months, it’s tough to get that solid impression for what the school is like. The same goes for visiting during weather-appropriate times—if you’re considering a school in a cold weather climate, be sure to visit at that time of the year. Some people love the cold, others are warm weather folk (like me down here in New Orleans!). Oh, and always check when Mardi Gras is happening before visiting Tulane. 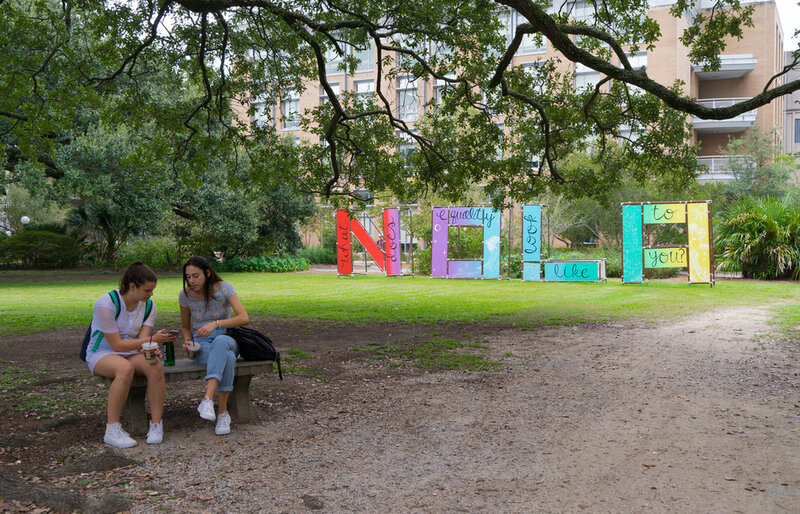 Great time to visit NOLA, but, not the best time for a visit to campus (we're closed!). 2) Pull the randoms aside. Your tour guide is going to give you some great facts and personal anecdotes, but go past that. When you're done with the tour, sit outside and see if you can chat with students. Ask them about their experiences, see how much love they have for their school. If the students who you talk to think it’s weird or are uncomfortable with you asking them questions, then maybe that is telling about the school. Tour guides are great but check with some other students to get the inside scoop. 3) Eat in the dining hall. There is no better spot on campus to get a true feel for the pulse of the campus than the freshman dining hall. Eavesdrop on conversations; see what students are passionate about and what the chatter is (I know, it sounds awkward, but do it!). Plus you’ll get to see how good the food is on campus, which is always an important factor! 4) Do your research before you get there. We are excited to have prospective students tour campus every single day. But what we like even more is when we can tell those students have done some legwork before arriving on campus. If you get to campus and you are asking your admission officer questions like “how large is this school?” and “do you have a psychology major?” it becomes quickly obvious to us that you may not have put too much thought into the school. We’d much rather hear “I read that psychology is your most popular major. Do you find it to be more of a clinical-based major, or maybe more neuroscience?” Here are some great questions you should be asking during your visit.